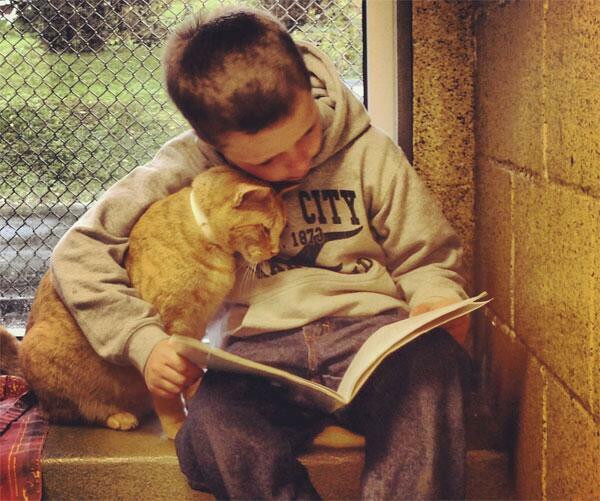 Reading has a soothing effect on cats, this boy proved it right! Home / Unlabelled / Reading has a soothing effect on cats, this boy proved it right! Finn is an adorable hairball who arrived at a Minnesota shelter with the intention of finding a family with whom he would spend the rest of his life. What he loves above all? Cuddles! So, there’s little to say when a little boy named Finn (too!) arrived as part of the program of reading for animals, he was thrilled! "Finn is the biggest fan of our little Finn reader, he does not miss a beat of his stories. " Hardly Finn begins to read his story as Finn the cat begins to rub against him, give him little paws and cuddle him purring. "Research has shown that reading has a soothing effect on cats. Similarly, it gives small readers confidence in their way of reading. " At the end of his reading, Finn lies down with his four-legged friend and gives him a huge hug. Shortly after, Finn finally found his family for life to the delight of the little boy who is happy to have spent time with the cat before his departure.